When winterizing your Boxster don't forget to change the blinker fluid and rotate the air in your tires. That way, your baby will be ready for the road in the spring. 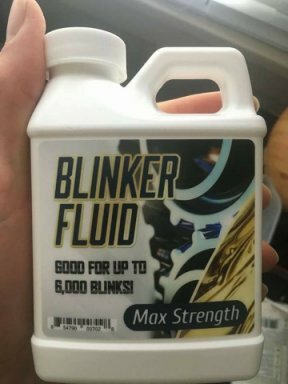 And, always use quality Blinker fluid so your turn signals stay clear and bright. I'm surprised there wasn't a "special surcharge" for washing the vehicle with a Hydrogen/Oxygen blend. BMW brand, of course. It was at that time I decided Porsche service had to be cheaper....or at least more honest. Argon is better, or neon. They are both more inert than nitrogen. Those gases cost a fortunes and that is why high end cars need them. Also, remember to grease your muffler bearings and ensure both rear fog lights function. If only one functions the car could pull to the left.